April 14, 2014 - "My Orders Are To Shoot"
We woke up before the alarm again - this time, Alert Alarm had called from Hawaii, letting us know the power was out there, as if we can do something about it from halfway around the world (or even if we were in Pahoa). Because of waking up so early, we were able to get packed more leisurely, and then ate breakfast at around 8:30 again. After breakfast, we checked out and got on our way. 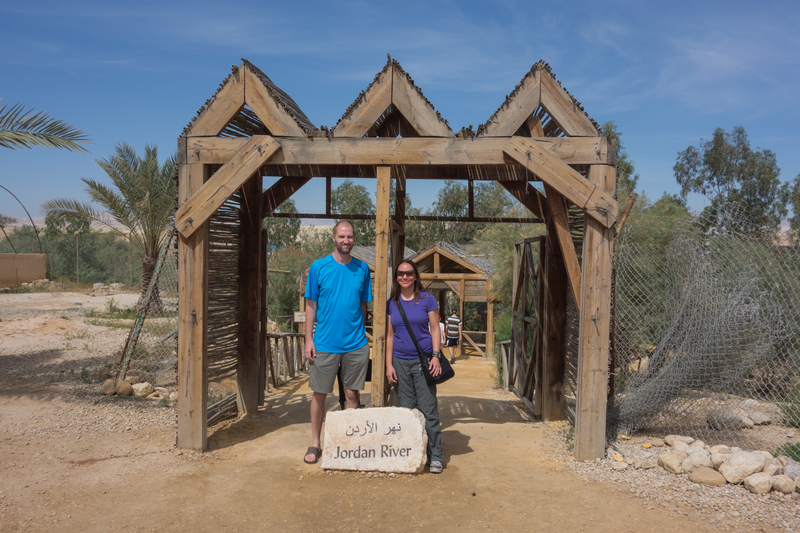 Our first stop was in Bethany, not too far south of Amman (but much lower in elevation, below sea level), right along the River Jordan. Theoretically, Bethany is the actual spot where Jesus was baptized by John the Baptist, referred to in the bible as "Bethany Beyond the Jordan." This whole area was unknown 20 years ago. While clearing land mines in 1996 (after reaching a peace agreement with Israel), someone in a tank backed into something. Antiquities people came in, started clearing, and realized what had been hit was a part of a church. And while clearing that, several other churches in same vicinity were found. 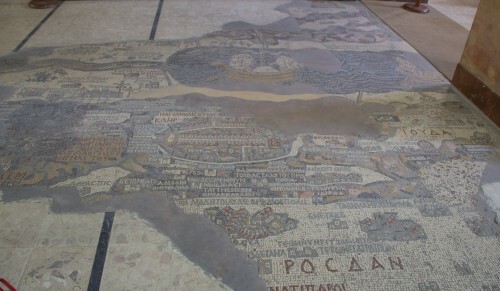 From the number of churches in one small area, plus matching descriptions from the Bible, people seem to have more or less settled on this being the spot - hopefully it was a bit cleaner 2000 years ago. 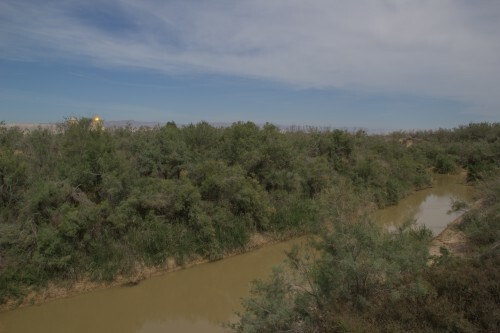 Very nearby, in the present spot of the River Jordan, there were entries to the river, and people getting baptized on both sides of the River - the Jordan side and the West Bank side. 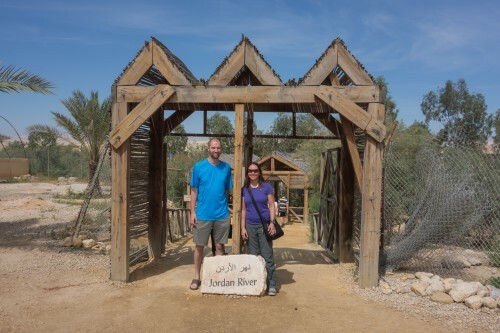 We finally realized that "West Bank" means West Bank of the Jordan River, which made sense, because we always wondered why the West Bank was to the east of Israel. Aziz had told us on the drive in that the two sides of the river were very close, and indeed they were, maybe 15-20 feet across. We had asked what would happen if someone tried to cross, and Aziz had actually asked the local military man (whom he must see 1-2 times a week) this very question; he was told "my orders are to shoot." He wasn't kidding. 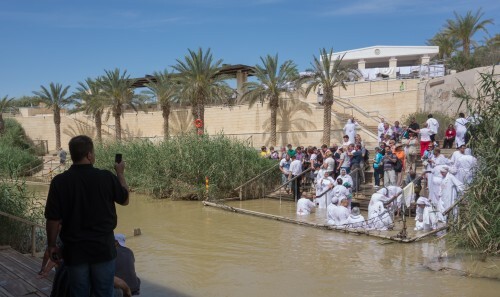 So while people were getting baptized on either side of the river, there were miltary folks on each side, with machine guns - a very odd dichotomy. Even with that oddity, it was quite a powerful spot to be, watching so many people being baptized and everything that goes along with that. Walking back to the vehicle, it was very weird to know that we were walking through the same areas we'd read about in the Bible, and thinking about all of the people who walked this same area 2000 years ago. We were wandering off thinking about that when Aziz told us not to veer off the trail because the bushes were full of poisonous snakes. 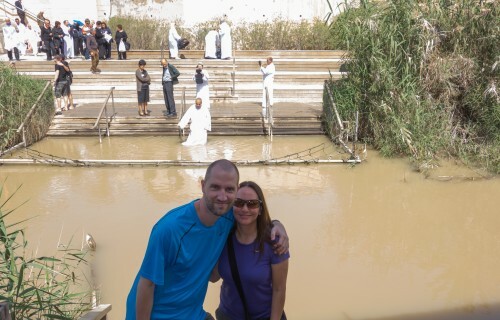 Our next stop was not too far away, at the Dead Sea. 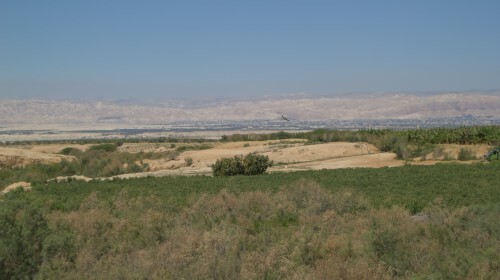 Driving down the road, we could see the oldest city in the world, Jericho, out to the east. 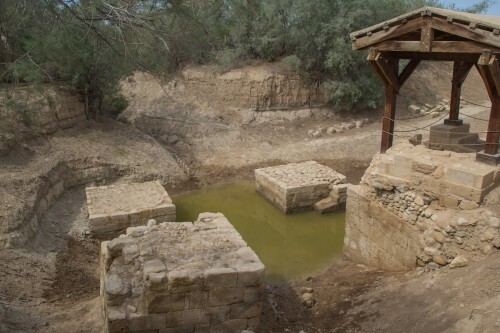 Jericho shows up all over the Bible as well, and archaelogical records show that it's been constantly inhabited for close to 10,000 years. 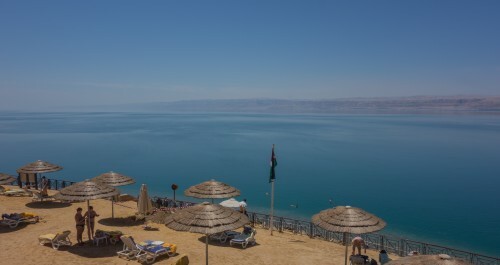 The Dead Sea is the lowest land elevation on the planet, more than 1400 feet below sea level. 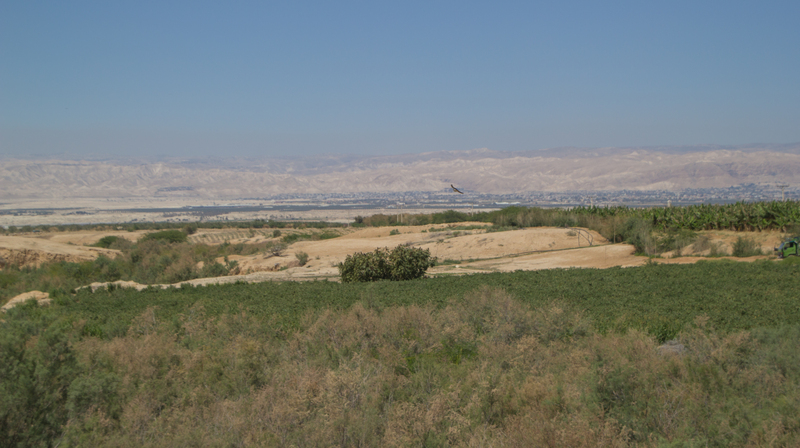 There are large hills around the Dead Sea, which is why it doesn't empty out into the ocean - or, more correctly, have the ocean empty into it. Because of numerous reasons, including the River Jordan being used for agricultural uses, the Dead Sea is drying out. It's salinity level is more than 30%, making it roughly 10x more salty than the ocean. The area around the Dead Sea reminded us a tiny bit of Cabo San Lucas, with desert everywhere and a number of high-rise resorts right on the water. The grounds at the hotel were so large, Aziz hailed one of the golf carts to take us down near the beach, rather than have us walk. It really wasn't necessary at all, but maybe for retirees it would have made more sense. 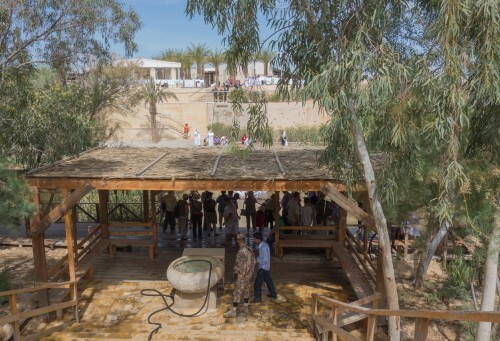 There were some changing rooms near the pools, and once we changed, we walked into the Dead Sea itself. Walking in the water was difficult (it was like there was more drag, and the floor was uneven with rocks), but floating was easy, just as advertised. Aziz had mentioned it wasn't good to stay in too long, and all we were doing was floating and soaking up sun, so there wasn't much need to stay in too long anyway. We got cleaned up in the changing rooms (as best we could, given all the salt), then had lunch right around 1. 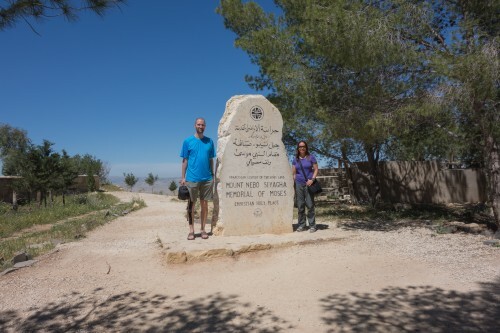 After lunch, we headed towards Mount Nebo. On the way there, we passed by an interesting resort - one that is specific to Muslim women, where there are no men whatsoever. Because of this, they can let their hair down (literally and figuratively). Mount Nebo is where Moses died after (finally) seeing the Holy Land that he would never enter. The area is maintained by the Franciscans, and the view (from 2700 feet up) is quite impressive. We had a pretty clear day, so we could see Jericho fairly clearly, and even Jerusalem was visible beyond the Dead Sea. Interestingly, as we were leaving, a big group of Indonesians were coming in - we would not have expected that. Aziz told us that the Pope would be coming to the area in a month or two, so there was a lot of renovation and cleaning going on at the site. 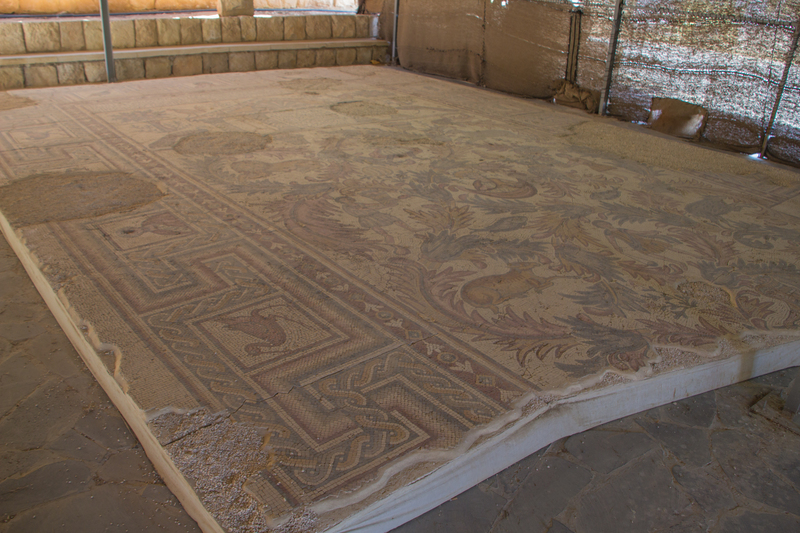 Our next stop was a mosaic shop on the way to Madaba. At the shop, we got to see how they made mosaics, and also how they made intricately carved wood furniture. As to the furniture, the short story is that there are a bunch of sticks (smaller than chopstick but bigger than toothpick) that are held together and glued into a big block, then the big block is shaved into 1mm slivers that are then attached to the furniture. Everything at the store was really really nice stuff, but even "straight from the source" we couldn't justify the price. 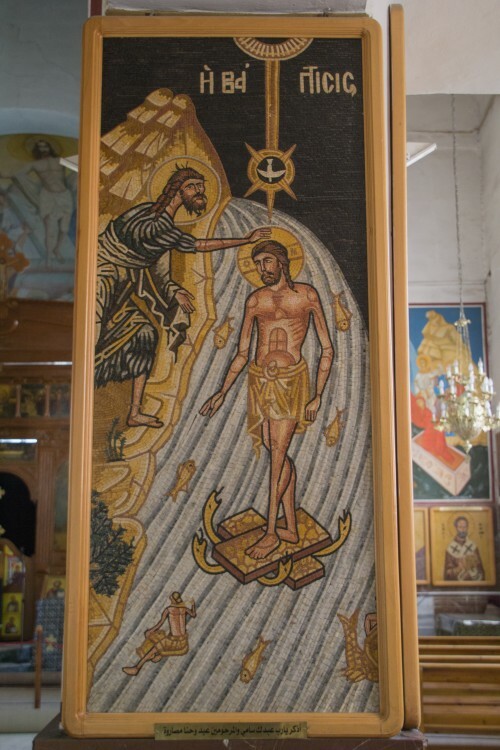 From there, we went to Madaba, which is a fairly large city, but is famous for an enormous mosaic from the 6th century, showing almost the entirety of the Holy Land, almost to scale, with items in the correct place. It is amazing that way back then they had gathered enough intel from enough people to know where everything was, and the distances from one spot to another. 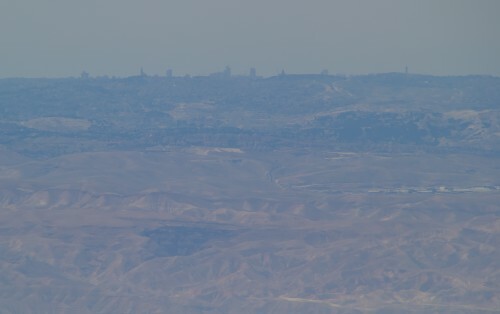 This was actually one of the data points used for determining which mountain was Mount Nebo (along with descriptions from the Bible that fit it to a T). After leaving Madaba, we had a long drive south to the Petra area. We each slept for awhile, but woke up for the last hour. We talked some politics again with Aziz, this time about the Syrian War. It was interesting to get a more local take that was more nuanced than a "good guy versus bad guy" argument. We got to the Petra area (called Wadi Musa) around 6:45, checked in to our hotel, and then immediately went to dinner, since we wanted to attend "Petra at Night," which was only tonight and not tomorrow night. Dinner was a huge appetizer (which we actually thought was the main course), followed by a main course. We had to skip dessert (which we probably would have, anyway), so we could leave on time. 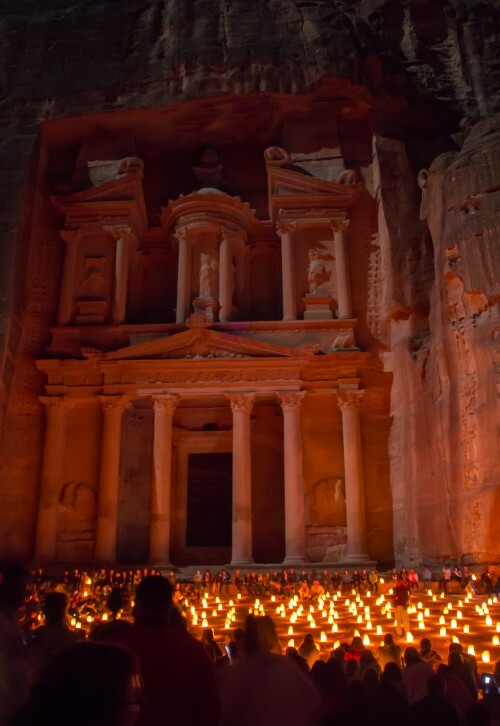 There were several hundred people walking along with us in Petra, so it was a bit claustrophobic walking through the Siq, especially since it was night time (even with full moon) and we'd never been here before. As an aside, this night was a lunar eclipse for most of the western world, but not the middle east, so we had to "make due." The Siq was very interesting, we were intrigued to see what it looks like during the day. The walk was 20-30 minutes (or so it seemed), with candles lining both sides. 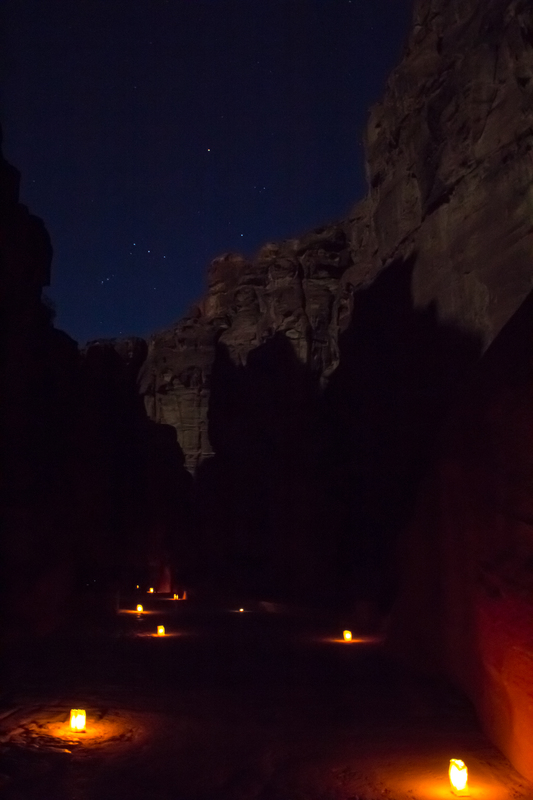 The full moon was illuminating some of the rock faces on the Siq, which was very cool. 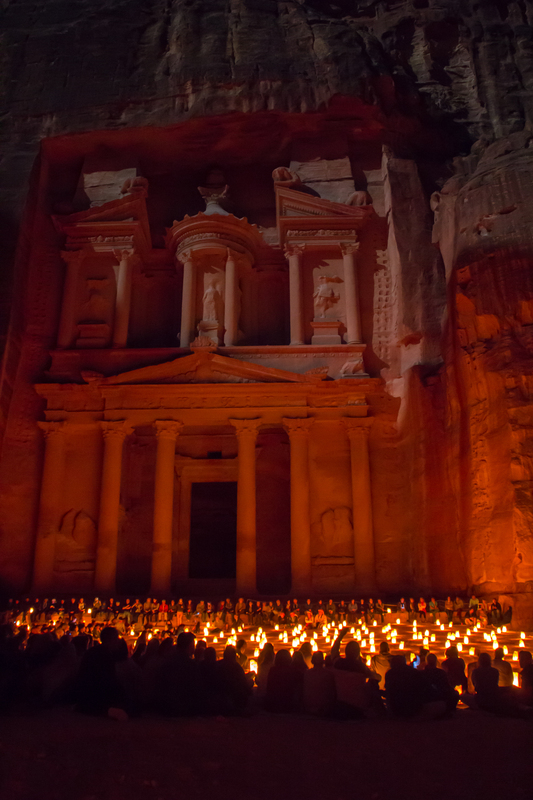 At the Treasury (famous from Indiana Jones), there were a ton of candles, and people playing music. It should have been phenomenal, but instead it was lukewarm because people were very loud (one guy was seemingly in a loud argument on his phone), wouldn't sit (even when told by the Bedouins who were running things), wouldn't move out of the way (even when told by the Bedouins), and then all of the other patrons were derogating the ones who weren't being polite. All in all, it was a lesson in bad manners - the yang to the yin of this morning at Bethany, where folks from Jordan and the West Bank were enjoying life in harmony along the riverbank (albeit with machine guns). That being said, Petra was still very nice, and we were very much looking forward to going back the next day in the light, hopefully with less people.